(Left to right) David Perry (violin), Jeannie Yu (piano) and Walter Preucil (cello). Photo courtesy of Midsummer’s Music Ltd. Known for presenting concerts hailed as “exciting, pulse-pounding and riveting,” Midsummer’s Music of Door County announces its 2019 concert season: World-class musicians will present 41 concerts during the season, which runs June 14 through Sept. 2. 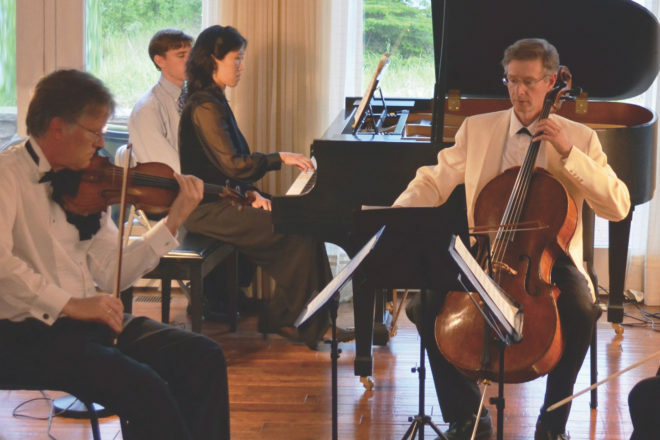 Midsummer’s Music musicians play chamber pieces for strings, piano and winds in distinctive Door County settings, including art galleries, museums, historical places and private homes. Programs feature works by Mendelssohn, Mozart, Schubert and Dvořák; gems by lesser-known composers; and world premieres by Midsummer’s Music’s own award-winning composer-in-residence, Jacob Beranek. Quintet for Winds will have its world premiere on July 11. Tickets are $29 per adult, $10 per student, and free for children 12 and younger. Premium prices apply for salon/home concerts, dinner concerts and other special events. Flex-packs of six or eight tickets are also available. Visit midsummersmusic.com to purchase tickets and review the complete 2019 summer brochure.